Why are zircons are loved by geologists so much? Firstly, zircons are all too common in the Earth’s crust. It occurs in igneous, metamorphic, and sedimentary rocks. 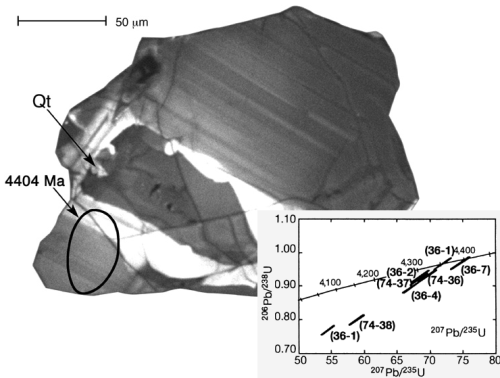 Zircons are able to survive geologic processes such as transport, erosion, even metamorphism (recrystallization), are chemically inert and they have much to tell about the geologic processes that occurred in history. However, the greatest thing is that within this mineral are uranium and thorium, and thus can be dated by the extremely accurate Uranium-Lead dating method, fission track dating, and (U-Th)/He dating. Western Australia, a 4.404 billion year old zircon grain have been found, about 130 million years older than the previous record. Stunning, indeed. What’s more, a high ratio of stable isotopes was calculated using the δ18O method (7.5 – 5.0%), and the magmatic oxygen isotope ratios of such range points toward the possibility that the the oceans may have formed 4.4 billion years ago, 100 millions years than previously expected! While this is still under debate within the scientific community, it nevertheless provides an exciting point of view. 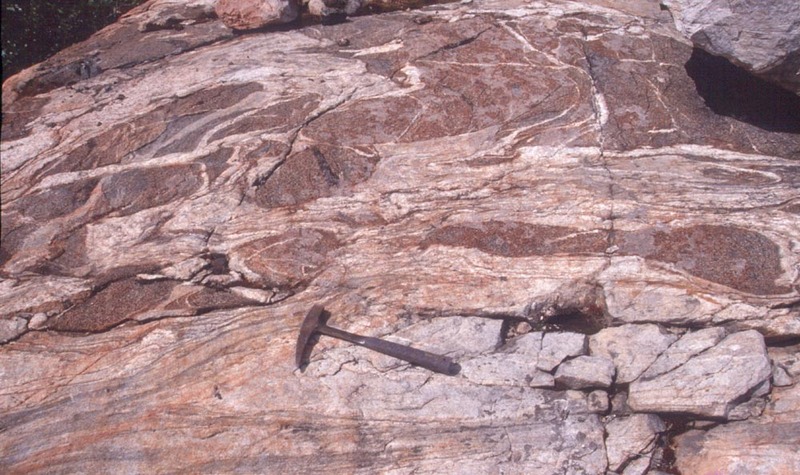 The Acasta Gneiss Complex is a rock outcrop located at Slave Province, Northwest Territories of Canada. Dated to be at about 4.04 billion years old in the Hadean period (informal), the Acasta Gneiss complex is the oldest exposed rock to date. A zircon dated 4.2 billion years old using mass spectrometry was also found within a 3.9 billion year granite rock, providing further evidence that the Acasta Gneiss Complex is the oldest rock to date. On the weight of evidence from other studies in the area, I would still consider that 3.8 billion years is more likely the actual age of the rocks. Nevertheless, should overwhelming evidence arise for the 4.28 billion year old age of the Nuvvuagittuq greenstone belt, it would be plain awesome. Despite being so old, rocks and minerals still do not tell us when was the formation of the Earth. Why? Well, with the combined forces of geologic processes such as plate tectonics, weathering, eruptions and hydrothermal circulation destroyed most of the evidence available by mixing them and constantly resetting the point of closure of minerals. Thus, we have to look towards the fallen stars for an answer. But why meteorites? Firstly, meteorites are big pieces of rock without the dynamic geologic processes associated with the Earth; that is, they’re quite static, and the crusts have never been recycled. Secondly, it is only fair to assume that everything in the Solar System formed from the same molecular cloud, and the age of meteorites give hints to the true age of the Earth. Around 50,000 years ago, the Canyon Diablo meteorite smashed into Arizona, creating the Meteor Crater/Barringer Crater. This meteorite is particularly special as it a big piece of a rare type of meteorite that contains sulphide minerals (particularly troilite, FeS), metallic nickel-iron alloys, plus silicate minerals. In 1953, Clair Cameron Patterson dated the Canyon Diablo meteorite at 4.55 billion years old using Uranium-Lead dating, by measuring the amount of lead in the sulphide within the meteorite, and not surprisingly, it was found in much greater amounts than uranium, the parent nuclide. This date is supported by almost 70 well-dated meteorites with ages of 4.4-4.6 billion years. These meteorites, which are fragments of asteroids and represent some of the most primitive material in the solar system, have been dated by 5 independent radiometric dating methods (got this info from the United States Department of the Interior). 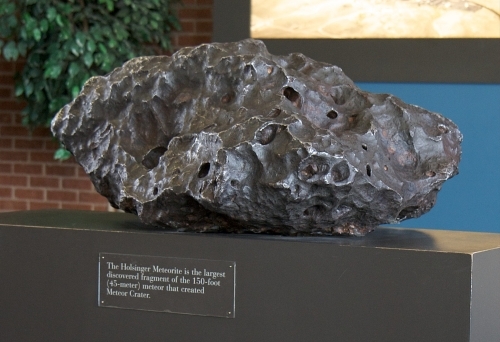 Holsinger Meteorite: the biggest recovered fragment of the Canyon Diablo meteorite. I did not hear that word, and I assume that many of you never did too. Yet, when Apollo 11 landed on the Moon, it fulfilled the our ancestor’s dreams of meeting the Moon. During the subsequent Apollo missions and the Soviet' Union’s Luna missions, many moon rocks would be taken home for research (plus those that fell to Earth as meteorites), and they all point to one thing: the Solar System is, at the very least, 4.5 billion years old. 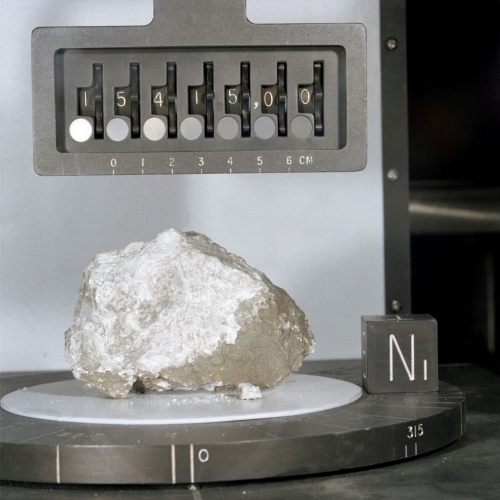 The rock samples from the Moon range from 3.16 billion years old for the basaltic samples derived from the lunar maria, and up to about 4.5 billion years old for rocks derived from the highlands. As there is has been zero plate tectonic activity and no atmosphere (no weathering), we can be confident that this represents a quite truthful age for the Solar System. Genesis Rock: A sample of early lunar crust from around the time the Moon formed. Returned by the Apollo 15 mission. Simon A. Wilde, John W. Valley, William H. Peck & Colin M. Graham. 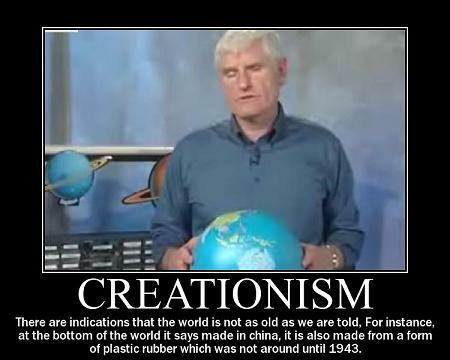 (2001) Evidence from detrital zircons for the existence of continental crust and oceans on the Earth 4.4 Gyr ago. Nature.